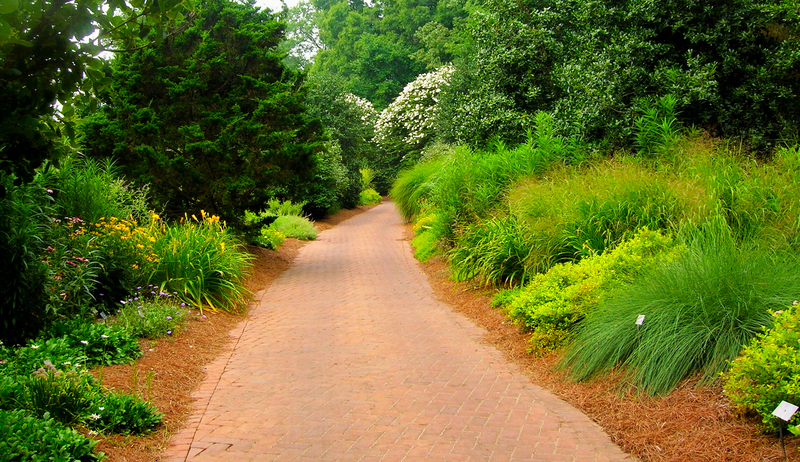 The Perennial Garden presents a comprehensive collection of perennials suited to the Tennessee Valley. The perennial palette consists of herbaceous perennials, hardy bulbs, vines, flowering shrubs, and small trees. The Perennial Garden makes up the largest component of the Four Seasons Garden. A distinctive gateway flanked by tall evergreens invites visitors into the Entry Court where the magnificent view opens up to the gardens beyond. The dramatic vista to the Damson Aquatic Garden in the distance is lined by low hedges curling off to the east and west to define the space and delineate the pathways into the Perennial Garden. The Perennial Garden consists of sweeps of flower beds lining the grass Allee, a river of emerald green which flows through the flower beds from the Entry Court to the Aquatic Garden in the distance. The flower beds, or borders, are interspersed throughout the Allee and fall on either side of the meandering brick pathway. Each of the borders has a theme, such as the Spring Border; Summer Border; Hot Colors Border; or Pink, Blue, and Silver Border, and the numerous plantings within the raised beds reflect the theme. The pathway leads to the Aquatic Pavilion and Cottage Garden, an intimately scaled “dooryard” garden. The garden’s main entrance moves straight to the pavilion or to the “cottage,” while the primary cross-paths terminate at arbor-covered benches set amid mixed plantings. Fragrant roses and peonies, clouds of gaura, verbena and patrinia float over clumps of asters and phlox.